New York Outrigger is pleased to announce that the Marriott Downtown hotel will provide discounted lodging for the 2016 Hawaiian Airlines Liberty Challenge. Discounted rooms are available for check-in as early as Thursday, June 9 and checkout as late as Monday, June 13, 2016. Reservations must be booked by May 12, 2016 to be eligible for the discounted rate. The New York Marriott Downtown is located at 85 West Street, a fifteen minute walk from the Race Venue at Hudson River Park’s Pier 26. 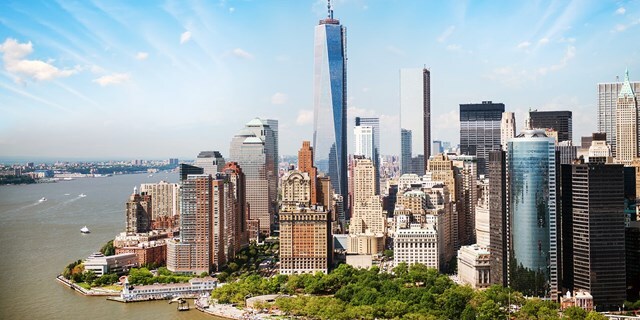 It is also within walking distance to a variety of Downtown sights with easy access to most subway lines for easy connection to the rest of New York City. Enjoy upscale ambiance with their Lower Manhattan accommodations, complete with deluxe rooms and quality amenities. The New York Marriott Downtown is the only Marriott hotel centrally located in the Financial District within walking distance to Wall Street and NYSE. Fresh from a renovation, their stylish and elegant hotel is just moments from landmark attractions like the Statue of Liberty and the 9/11 Memorial. Take in a casual meal at their new restaurant, Bill’s Bar & Burger, boasting some of the best burgers in NYC, refuel at the on-site Starbucks, or unwind in contemporary guestrooms with modern amenities and technologies. Plan now for meetings and productive conferences in the all-new events space, debuting in September of 2014. At the New York Marriott Downtown, it’s easy to experience all that the city has to offer. After all, it’s just outside our front door. Business Services Features: FedEx for all of your business services needs. Open 24/7 with your room key. We provide a complimentary Boarding pass printer. Fitness Center: Open 24/7 with your room key. ATM located in the hotel lobby.